At the beginning of the 17th century, the duke of Lerma, don Francisco Gómez de Sandoval y Rojas, a minister under Felipe II, sought favor from his son Felipe III upon the death of his formidable father. 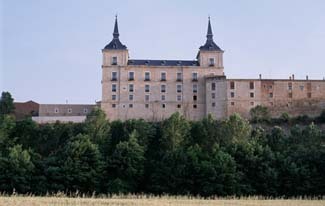 The duke, in order to attract the royal court to his palace began an ambitious project to build a structure to rival that of El Escorial. Beautiful and costly buildings, constructed with only the finest of materials, were designed by the leading architects of the day. Craftsmen and industry flourished; writers and artists flocked to Lerma to take up residence. Every other day was celebrated with a festival—religious and secular. Fireworks burst over the town. Finally, the duke’s own son successfully conspired to remove him from his position. The duke had mismanaged Spain’s affairs and had spent Spain’s wealth on luxuries when the country was nearly bankrupt. Lerma is a very pleasant, small Spanish town. On occasion, on the Plaza Mayor in front of the parador, concerts and theatrical productions are performed. Lerma, too, is just next to the Ribera del Duero wine region—home to some of the finest wines of Spain. Rates include tax. Breakfast extra. Lerma is 36 km south of Burgos off route A-1. The parador is on the Plaza Mayor. Opened in 2003, the Parador de Lerma showcases the would-be extravagance of one of Spain’s more colorful personalities: the duke of Lerma. Situated on the highest point in the center of town, the austere and massive appearance palace belies the warmth and comfort inside. The most striking feature of the palace is the great interior patio surrounded by 40 columns of Tuscan and Ionic style, with an enormous skylight above. Guest rooms look down on the patio. They are handsomely decorated with the occasional hand-carved piece of furniture and terra-cotta floor with throw rugs. All have large modern bathrooms. Some rooms have views. Arched ceilings look down on the restaurant, located in the oldest part of the palace. You’ll find on the menu typical Castilian cuisine such as suckling lamb roasted in a wood-fired oven, stews, and blood sausage with rice. Fresh river fish are lighter options. Each of the four towers holds a guest room with a canopied bed and a 360º view.